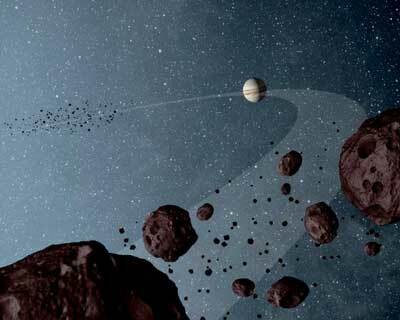 (Nanowerk News) It is known that gas giants around other stars are often located very near their sun. According to accepted theory, these gas planets were formed far away and subsequently migrated to an orbit closer to the star. “This is the first time we have proof that Jupiter was formed a long way from the sun and then migrated to its current orbit. We found evidence of the migration in the Trojan asteroids orbiting close to Jupiter”, explains Simona Pirani, doctoral student in astronomy at Lund University, and the lead author of the study (Astronomy & Astrophysics, "The consequences of planetary migration on the minor bodies of the early Solar System"). According to the calculations, Jupiter’s migration went on for around 700000 years, in a period approximately 2-3 million years after the celestial body started its life as an ice asteroid far from the sun. The journey inwards in the solar system followed a spiralling course in which Jupiter continued to circle around the sun, albeit in an increasingly tight path. The reason behind the actual migration relates to gravitational forces from the surrounding gases in the solar system.